If you want to set up a company in Hong Kong then consider working with Fung, Yu & Co CPA Limited who have 40 plus years of experience. Setting up a new company in Hong Kong is ideal for foreign investors for a number of reasons. Many entrepreneurs start a business in Hong Kong instead of China because it can be easier to register a business, although that can be offset by the difficulty with opening a corporate bank account. There are three different types of companies a foreign investor can create in Hong Kong, and you will want to study these three options before you file any paperwork. Each has its own advantages and disadvantages. Once you have decided on the company type, you will need to register your business, open that corporate bank account, and learn how the Hong Kong tax system works. Our Hong Kong company registration service can streamline the whole process for you and get your business registered and working as soon as possible. The first thing you must do before creating your company is to determine which of the three types of businesses fits your needs the most. Once you have created a company, you cannot simply change its business type. Instead, you would have to dissolve that company and start a new one. Because of all the work that would take, you want to be certain that during the incorporation process you are registering as the correct business type. The most common type of business is the limited company. This company is a full business in Hong Kong. This means you can take advantages of the various tax benefits available to all incorporated firms in Hong Kong. Limited companies do receive tax benefits under the Closer Economic Partnership Arrangement (CEPA), which is a free trade agreement between Hong Kong and Mainland China. A limited company is a good choice for those who want to base their operations in Hong Kong, although it does require more work to set up. The second option is for companies that have already incorporated in another country but still wish to have an office in Hong Kong. By establishing a branch office of your parent company, you can take advantage of the fact that your corporation already has established credit and cash flow in another country. Once you have established your branch office in Hong Kong, you will have one month to register it with the Companies Registry. You will register as a Registered Non-Hong Kong Company. Legally, your branch office is not seen as an independent business. This means you may not pay as many taxes as you would as a limited company, but you will also not be able to take advantage of as many tax breaks or concessions, either. Your third option is to register as a Representative Office. This option does not work for any business that wants to make a profit in Hong Kong. Representative offices are legally limited in what they can do. Many corporations open a representative office in order to examine the Hong Kong economy before they create a branch office or open a limited company. A representative office can be converted into either type of business at a later date. If you are creating a limited company, your business must comply with all the rules and regulations for such a business. One of these regulations is that you must file your company name with the Registrar of Companies. There are some special rules regarding your business name. The most difficult regulation you must follow is that your company name cannot be the same as any other name appearing on the Registrar’s index. You may do a company name search through one of several different websites first to ensure that you are not accidentally filing for a name that is already in use. Many common family names and industry-related names may already be taken, requiring you to be creative in finding a name that is both available and describes your business. As a private company, your limited company in Hong Kong will have a board of directors. One of these directors must be a natural citizen of Hong Kong. Your company must also have a company secretary who is a separate individual from the director. It is possible for your company’s board to be made up of one director and the secretary, but your board can never be smaller than these two individuals. The company secretary may or may not be a natural citizen of Hong Kong. If he or she is, then he or she should live in Hong Kong. It is possible for another corporation to serve as the company secretary. However, in this case, that company must have a place of business or registered office in Hong Kong. You may have directors on your board who are not Hong Kong residents. Here are Fung, Yu & Co. we are experienced in serving as the Company Secretary for our clients and include this as one of our services. Another regulation that limited companies must follow outlines where their registered office can be located. As expected, any limited company incorporated in Hong Kong must have a registered office located in Hong Kong. Note that you do not have to actually purchase land in Hong Kong or even lease a building if you do not plan on running a business that requires that clients come to your office. While virtual offices are an option in Hong Kong as a complete office solution, if you just need a legal address we can provide you with the services of registered office and a company secretary too. There are very few rules governing who may or may not be a shareholder of a limited company. Shareholders do not have to reside in Hong Kong, and there is no minimum number of shareholders required. A single shareholder can serve as the company’s director. The final step of registering your Hong Kong company is to register your business with the Registrar of Companies. You will need to submit your registration form, which can be done online, for most businesses. You may need to file a number of additional documents and your Articles of Association if you are creating a limited company. Registering does include several fees, and you will need to pay additional fees yearly to keep your business license. Once your company name is listed on the Companies Registry in Hong Kong then you are legally in business. Our Hong Kong company setup service will not only help you to open a company in Hong Kong but we can go beyond the formation stage and assist with the financial services using our many years of experience with banks in Hong Kong. Obtaining a Corporate Bank account in Hong Kong can be a tedious and difficult process due to the strict regulations which are enforced here. If you want an HSBC corporate account then it may take weeks and considerable paperwork to get approval, or to get rejected and to know what you should move on to another bank. We have considerable experience with HSBC and DBS bank and can assist you through the DBS corporate bank account opening procedures. If you need assistance with creating a business in Hong Kong, our experts here at Fung, Yu & Co. can assist you. 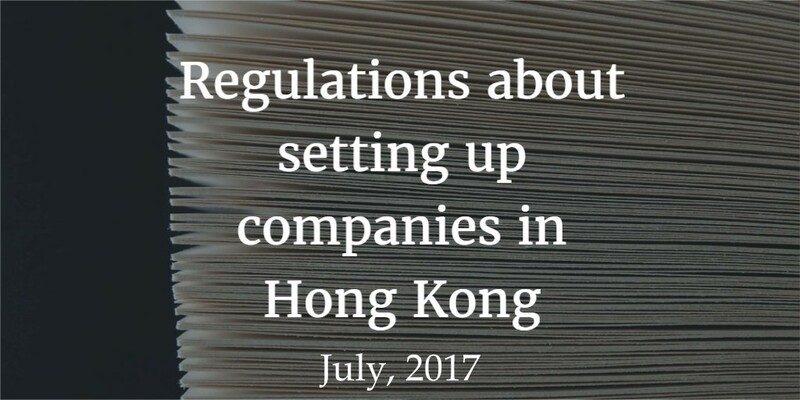 As a limited Hong Kong company, we have gone through the steps to register and will be able to help you understand anything about these regulations that you may have questions about.